When it’s really hot outside, and I feel too lazy to make a cocktail, all I want is a bottle of rosé. From May through September, there is always at least one bottle in the fridge, waiting for me. Sitting in the front yard with a pretty pink bottle on ice, chatting with my neighbors as they take the evening (or afternoon) walks… well, there’s nothing better. I want rosé to be simple, and unassuming. I don’t want to taste too much of it, it should be pretty quiet. While I don’t necessarily have a favorite vineyard, or a favorite bottle (ah, there are so many out there! ), I do have two simple rules when I head to my favorite wine shop. 1. It should be from Provence, France. Now, I’m sure there are other places that make a pretty good bottle of wine, but Provence has never let me down and other areas seem to be a little more hit and miss. Mostly, too sweet for my taste. 2. It should be the lightest, faintest, just-a-hint-of-color pink. That middle bottle up there, that’s almost too dark, but it’s delicious, so I let it slide. Anything darker and it just misses the mark for me. 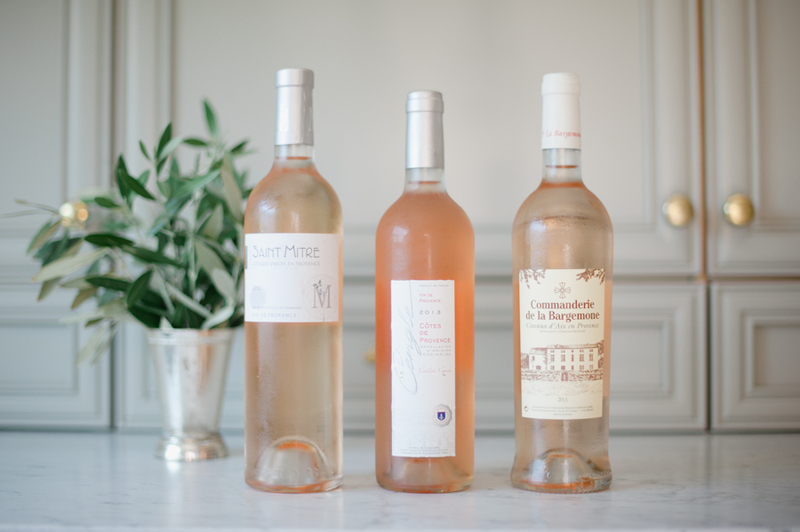 The hardest part about rosé is that I haven’t found a grocery store bottle that works, so you do have to make an extra stop at a wine shop or liquor store. But, I promise it will be worth it! And one other favorites… Chateau de Campuget Costieres de Nimes.